This fighting game began the story of the Sakazaki family and Robert Garcia. Yuri Sakazaki has been abducted by Mr. Big to punish her father, Takuma, and her brother, Ryo. To rescue her, Ryo and Robert must take on numerous enemies around South Town, eventually reaching the mysterious Mr. Karate. The passion of the game’s creators is evident in the unique game play elements introduced. These include an energy gauge that is depleted every time a fighter uses a special maneuver, Desperation Attacks that are usable only when a fighter’s health is low, and camera zooming that adjusts on the fly as fighters move around the stage. All these features ensure that players use strategy and tactics, rather than simply mash buttons. Adding to the mix are little touches such as characters showing cuts when they are injured and voice-over samples during cut scenes. Can you perfect the art of fighting and save Yuri? 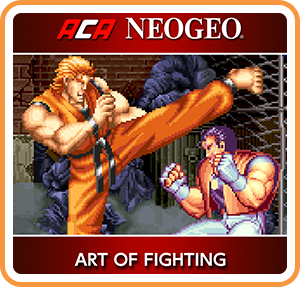 Where can I buy ACA NEOGEO ART OF FIGHTING physical/digital?